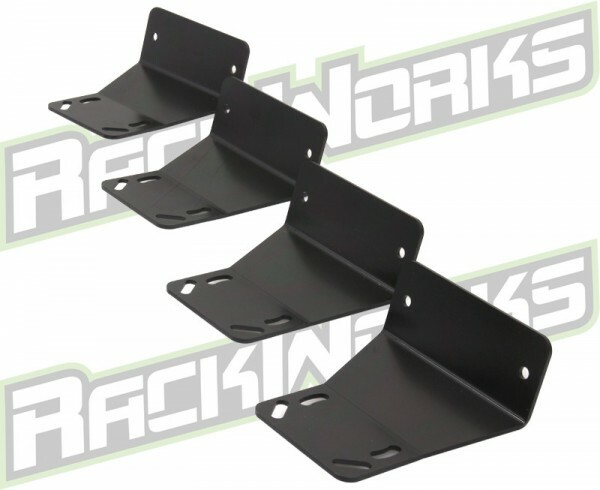 VSR (Vehicle Specific Roof) mounts. The VSR line of mounts are designed specifically using cutting edge cad technology to give you a mount that, although, has the rugged durable look will mount and fit the factory roof perfectly. We know you like to use your truck or vehicle to its full potential. These mounts ensure specific placement on your vehicles roof to give you the strongest attachment point possible. Like our other mounts, unique slotted bolt pattern also allows the mount to rotate to help fit factory roof lines when adjusting placement on roof from front to back. The 6 hole pattern on the Rubicon Series Side Rail allows the mount to adjust in height and help fine tune the roof rack mounting height off the roof. Sold in set of 4, fine texture black powder coat. Hardware included. • (4) “L” shaped mounting brackets. • Unique slotted bolt pattern for curved roof lines. • Upon removal of steel mounts use Yakima (Landing pad 6. part# 8000226) for concealing holes. • Riv-nut install tool required. •Do not exceed the weight limit of your vehicle’s Factory Bare roof, Roof Rail, Roof Track or Crossbars.